A SENIOR OFFICIAL working with a homeless charity organisation has hit back at statement made by the former chair of the Housing Agency that homelessness is “normal” and that people working in advocacy were “goading” the government. 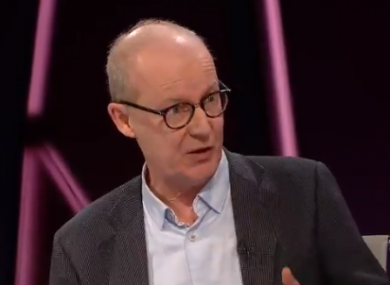 Mike Allen – director of advocacy with Focus Ireland – appeared on RTÉ’s Claire Byrne Live last night and responded to comment made by Conor Skehan last week. Skehan – who served as chair of the government’s Housing Agency before he stepped down last year – repeated his claim that homelessness was “normal” and also hit out at homeless charities. Allen and a number of officials working within the NGO sector, as well as opposition politicians and others took issue with Skehan’s comments and criticised them heavily. Speaking yesterday, Allen said that what Skehan was saying was to people was that homelessness was something that people shouldn’t “get too worked up about it”. “That we should just say, ‘well homelessness is one of those things we wouldn’t really want to get too worked up about it’,” he said. “And people like myself and Focus Ireland who are saying let’s take it seriously. We obviously goad him, as he says, upset him a lot. “He’s opening a very important discussion for us right now in Irish society and he’s right to say it is about our values. “But we have very different values than he has. We believe that what’s happening… is that homelessness isn’t just something that’s happening to people over there that we can ignore. It’s completely bound up with the high rents that people are facing, young people not being able to buy homes or rent homes, people facing mortgage arrears… It’s all part of it. Email “'We have very different values': Focus official hits back at Skehan's comments that homelessness is 'normal' ”. Feedback on “'We have very different values': Focus official hits back at Skehan's comments that homelessness is 'normal' ”.